CMS Canberra Mission Focus is an annual event run by CMS and local supporters in Canberra, where Christians gather together and focus on the enduring power of the gospel. You will spend time being engaged, encouraged and challenged by CMS missionaries as they share stories about how God is reaching the nations with his word. It is a time to reconnect with friends and make new ones, meet and be inspired by missionaries, and be refreshed for the year ahead. God’s mission to the nations is a glorious one. Lives are transformed. Hearts of stone are turned into hearts of flesh. And people all across the world find unity and fellowship through the Christ who saves. And yet, on this side of Jesus’ return, life and ministry is messy. Family troubles are brought to light. Illnesses disrupt plans. Relationship breakdowns bring hardship. And people involved in ministry often battle tiredness, loneliness and depression. How do we fix our eyes on the glorious truth of Jesus when life feels so messy? What hope and encouragement can be found? You are invited to CMS Canberra Mission Focus 2019 as we consider together the glory and the mess of gospel ministry. Mark Adams (Lecturer at SMBC and Pastoral Vice-Principal) will help us explore Revelation on Friday evening, and 2 Corinthians on Saturday. Come and be reminded of the God who promises to make all things new. 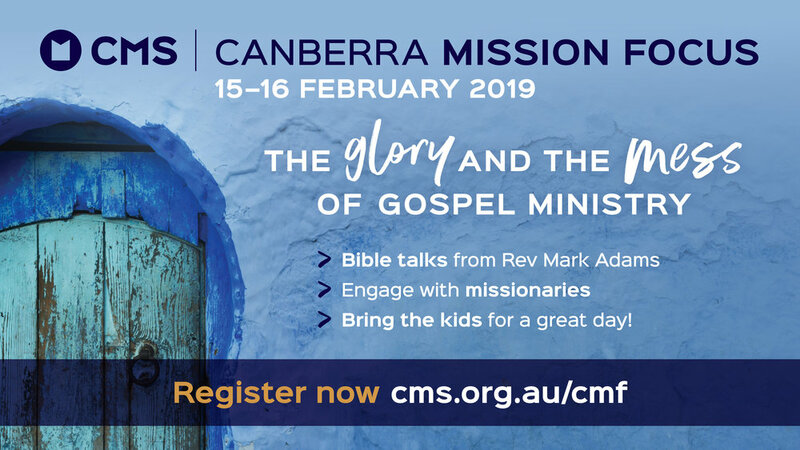 Online registration for CMS Canberra Mission Focus 2019 is now open. A concession discount of $10 off the total order for each concession holder is available. Please use the discount codes provided on the online registration page. Morning tea, afternoon tea and lunch are included in registration costs. Your whole family has a place in God’s mission. CMS Canberra Mission Focus has something for every age on the Saturday! Our missionaries, alongside a committed team of local leaders, will provide an exciting day of activities for children and youth where they will learn about the part they can play in God’s mission to the nations. Programs on the day include Crèche (0 – Preschool), Primary School (Kindergarten – Year 5) and Middle School (Year 6 – 9). Please register by 8 February to secure places for your children. To find out more, please contact the CMS Partnership Support Team on (02) 9267 3711 or email partnership@cms.org.au.